No problem with grapes in our orchard - our black Hamburg table grape has produced lots of small and medium sized bunches of good sized sweet, musky grapes. It's in quite a protected spot, so seems to have survived the vicissitudes of the weather this year rather well. 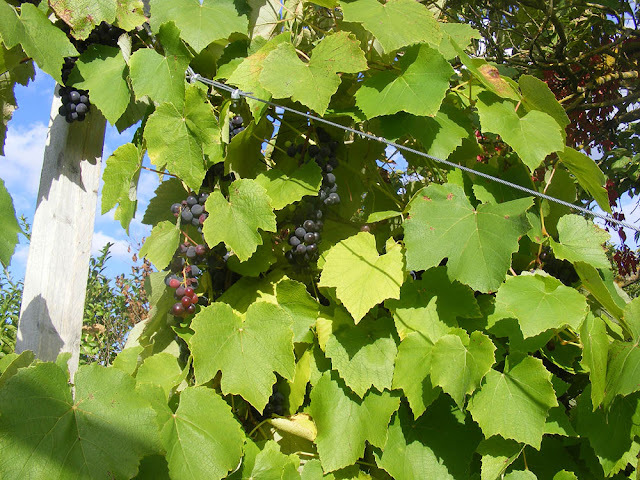 The local winemakers on the other hand, are reporting a crop about 50% down on average. Luckily the quality seems to be generally good, but some are worried the quantity will be so low they may not be able to meet their commitments to customers. 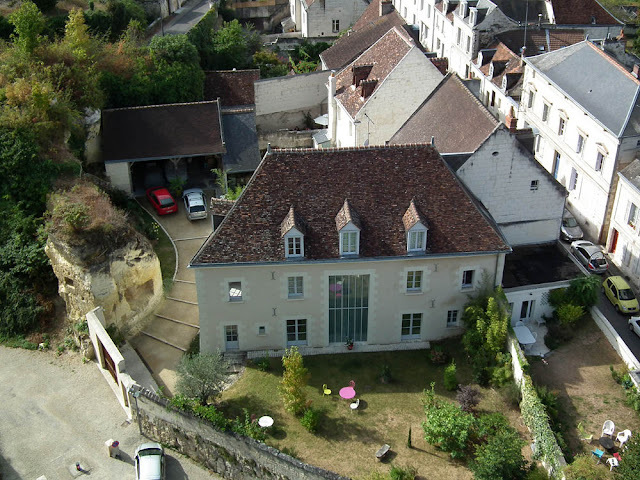 These houses in Loches are overlooked by the Louis XI Tower on the citadel. The owners should be proud of how attractively they have maintained the properties. You can see how dry it's been from the state of their lawns. The photo was taken on 23 September, just before this current round of stormy weather. I like what they've done with the huge glass opening in the big house. Very stylish and must improve the interior of the house considerably. Mind you, they (or their architect) must have an extremely good relationship with Batiment de France to have been allowed to create such a non-traditional feature - even if it can only be seen when you are on top of the tower. Because Antoinette gave me a Herman sourdough starter recently I've been casting around for things to use the ever growing monster on. The Herman website features cake, cake, cake and cake. I wanted to make bread, so I have started modifying the starter to be a bit less sweet. 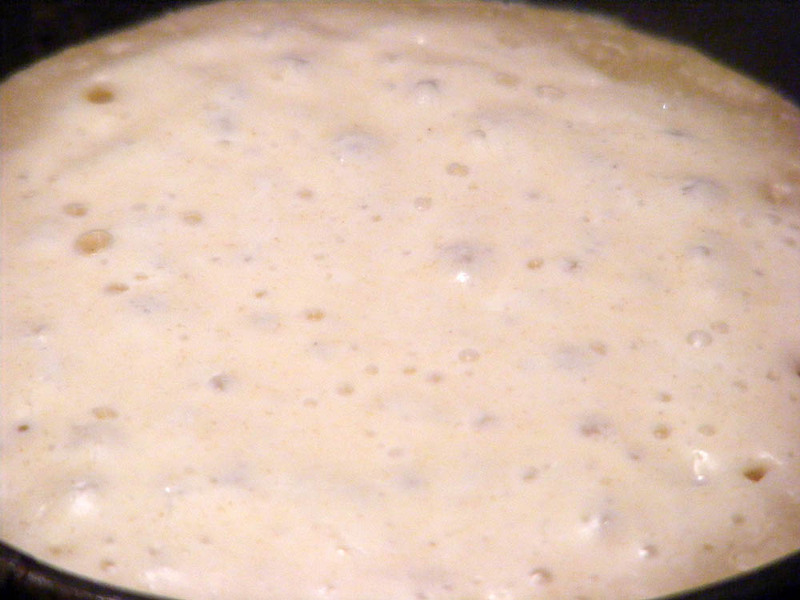 Once it is a mature starter with plenty of yeasty beasties you can reduce the amount of sugar and just rely on adding flour periodically to feed them (and liquid in the form of milk or water to keep it at batter consistency). It may smell nasty, but it works a treat. You can also keep it in the fridge to send it to sleep for a few days if you are away, or fed up with weekly baking to keep it in manageable quantities (or have run out of friends to pass it on to). The more mature your sourdough the better the flavour it gives to your baked goods and the better it modifies the gluten without any effort on your part (ie it's great for no-knead breads). Crumpets are one of those things, like golden syrup and powdered mustard, that you cannot buy in France. Fortunately they are not an essential anglophone staple, but they are nice to have from time to time. So I consulted my bread baking bible, Bread Matters by Andrew Whitley, and checked out how you make crumpets. One cooking and one ready to eat. He says crumpets are a ciabatta dough with extra water added to turn the mixture into a batter. The preparations must be done over several days, but I have discovered that the batter keeps well in the fridge, so you can make a couple of crumpets fresh for breakfast several days in a row. This is better than cooking the whole batch at once if you are not going to eat them immediately. Homemade crumpets do not keep well. You can toast day old crumpets to refresh them, but it is very definitely a compromise. Dissolve the yeast in 150 ml water. Add 150 g flour and mix well. Leave to rise for a day or two (it will bubble madly and expand hugely, then collapse - this is fine and what it is supposed to do). Combine the sponge dough you have created with the sourdough starter and all the rest of the ingredients in a mixer using the cake beater. The water can be cold (if the batter is destined for the fridge to rise) or warm (about 34C if for consumption later the same day). Mix on the slowest speed for 15 minutes. If the mixture is clearly not pourable add some more water. It should be thicker than pancake batter, and only just pourable. Leave it to develop bubbles for a couple of hours (or overnight in the fridge). Heat a griddle on a medium flame and brush it and a 10 cm metal ring with oil. 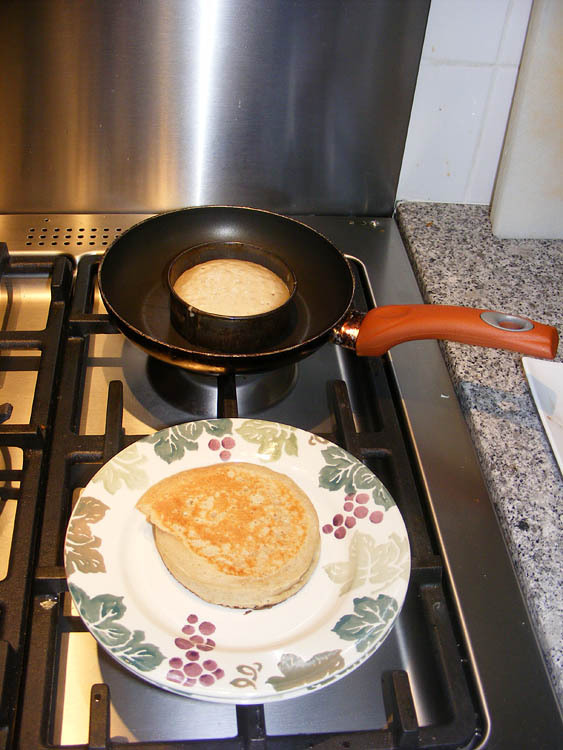 Place the ring on the griddle and pour in about 1/2 a cup of batter. Reduce the heat to low. Cook until the top has dried right across and has no liquid batter centre - this will take a good 20 minutes. It should have formed the characteristic bubbles which leave holes in the top. Remove the ring and flip the crumpet for 3 minutes on its top. Try to hold your nerve, but if you think it is burning on the bottom, if necessary, turn the crumpet early. Smear with butter and honey and enjoy for breakfast. I was born and spent my early childhood in the Australian state of Victoria. This means I pronounce castle as 'cassel', plant as 'plant' (not 'plarnt') and so on. In 1971, when I had just turned 12, my family moved to Queensland, and I encountered a whole new dialect. Ports strapped to the top of a Renault 4CV Sport. In Queensland castles are 'carsells', which is not too difficult to acustom yourself to, but I found that I no longer took a case to school. Suddenly, I was lumbered with a port. Not only that, but in Victoria I would have started the new school year in First Form at High School. In Queensland, I still had a year of Primary School to go and was in the 7th Grade. Plus they wrote funny and I was always getting into trouble for the way I formed my 'r's, 's's and 'f's. 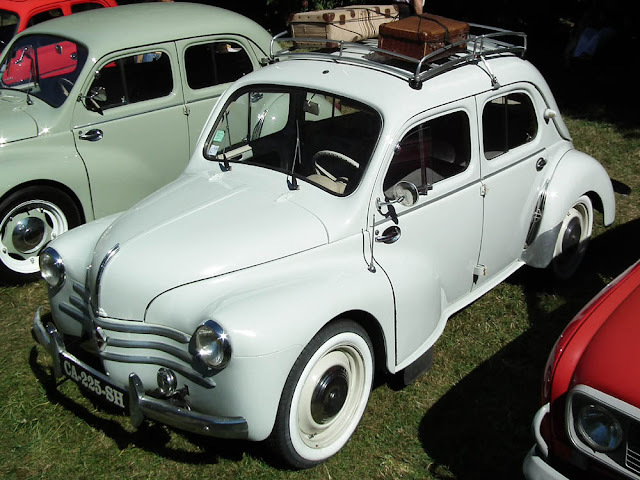 More ports strapped to another Renault 4CV Sport. I eventually discovered that 'port' was short for 'portmanteau'*. I also discovered that I no longer had a dressing table in my bedroom, but a duchess, and I was expected to drink and enjoy a disgusting substance known as 'sars' (pronounced 'sarse'). This was apparently short for 'sarsparilla' and was the most popular flavour of soft drink in the area we moved to. 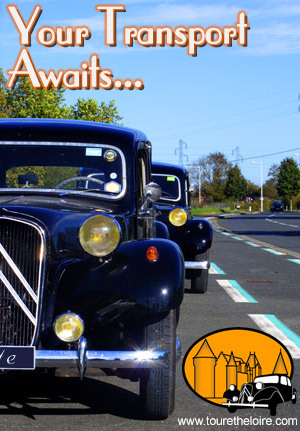 Ports on the back seat of a Citroen Traction Avant. The 70s were interesting times in Australia, especially if you lived in Queensland. The State Premier, from 1968 to 1987, was Joh Bjelke-Petersen, an ultra-right wing, Christian fundamentalist. (State Premiers are the equivalent of State Governors in the US, but not to be confused with the actual State Governor, who is appointed, not elected, as the Queen's representative.) By the time I had finished High School he had established a police state wherein there was no right of assembly on the street to publicly demonstrate and various of my friends and acquaintances had been arrested for daring to protest about the Springboks touring or just for being in a group of pinko University of Queensland students on the street. As Peter Beattie, then one of the student protestors, but who would go on become State Premier himself, said, '...they had a dossier on everybody'. The police were given free rein to harrass and intimidate as they saw fit, especially journalists and activists. Ports strapped to the roofrack on a Citroen Traction Avant. Joh even meddled in Federal politics, playing a key role in the downfall of the Federal Government, led by the charismatic Labour Prime Minister Gough Whitlam. When Joh arranged for 'his' Senator to be elected to the Federal Senate, it allowed the Opposition Leader Malcolm Fraser to block supply. The Government ran out of money, public servants' wages were not paid, and I can remember people discussing, in the privacy of their homes, whether the Armed Forces would stage a coup d'etat. 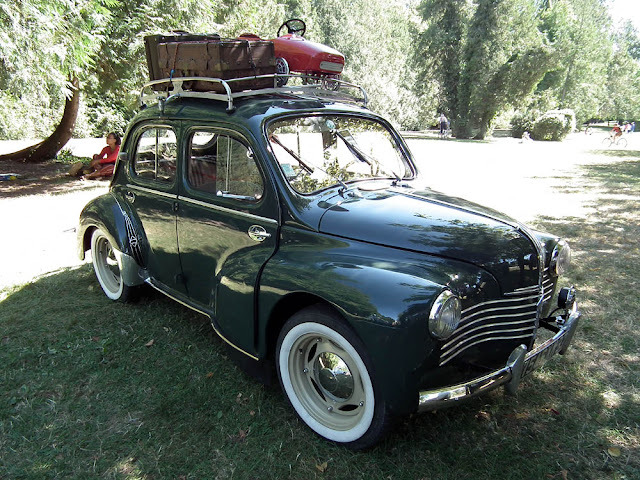 A port strapped to the back of a vintage sports car in the carpark at Chenonceau - Célestine in the background. Eventually suspicions about Joh's sharp business practices grew too great to contain. He famously despised journalists, arresting any he really disliked or refusing them police passes and releasing information at the last minute so that there was no chance to do any research. Finally, the Australian Broadcasting Commission (ABC, the Australian public radio and television network) aired The Moonlight State, alleging massive corruption amongst government ministers and the police to the highest level. The FitzGerald Inquiry corroborated all the accusations made by the investigative journalists and several of Joh's ministers and the Police Commissioner went down, while he himself retired from politics. Joh Bjelke-Petersen was only ever charged with perjuring himself at the Inquiry, but the case collapsed due to issues with the jury. *Despite appearances, 'portmanteau' is not a French word. The French word for suitcase is valise. The French word for 'coatstand' is portemanteau. 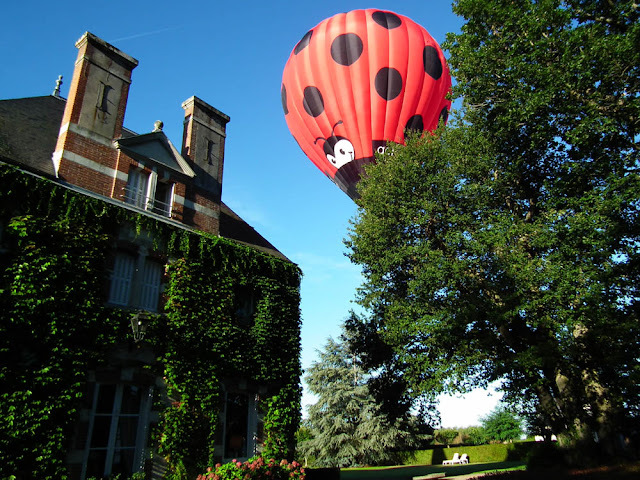 A balloon looms over Domaine Hauts de Loire, near Onzain. 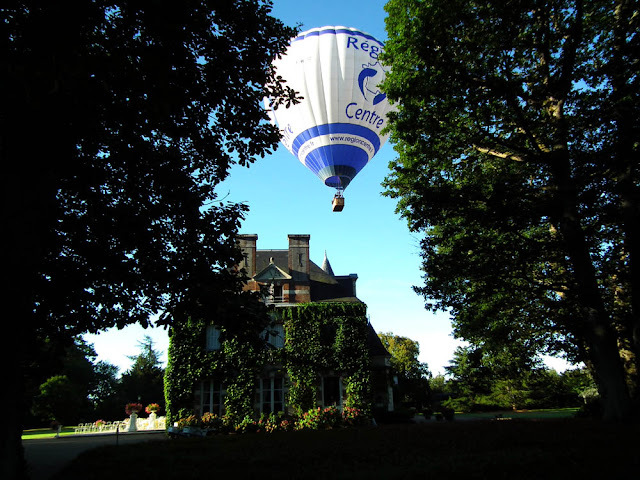 A balloon floats over Domaine Hauts de Loire, a chateau hotel near Onzain. We are finding the new blogger setup a bit tedious to get to grips with, so we are using it as an excuse / trigger to ease off the blogging a bit. Like many longterm bloggers seem to be doing, we will no longer reliably post every day. Over the winter I hope to concentrate on Loire Valley Nature, my somewhat ad hoc field guide to the local area's wildlife. Winter time is always fairly hard going on a daily blog about central France, so your pickings on Days on the Claise may be a bit lean for a while. Likewise, in the spring, summer and autumn, we hope to be busy with clients, garden and other projects (some of this busy-ness relies on self-discipline and organisation, so we may blog as a displacement activity - or as I like to call it - creative procrastination). 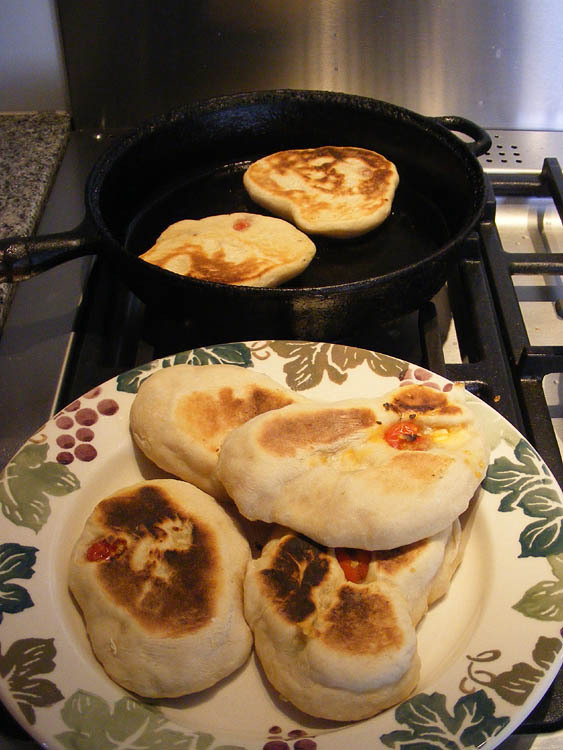 Fouaces, or fouasses, often called fouées (to the west) or fougasses (to the south), are the local Touraine version of pita bread or foccaccia, that is to say, they are a small soft stuffed flat bread. Medieval in origin, they were originally made at either the beginning or the end of a baking session, when the big brick wood fired boulangerie ovens were either heating up or cooling down. If baked at the beginning of a session, they allowed the baker to judge the temperature of the oven. Generally they are cut open and stuffed with rillettes, to be eaten while still warm. The reknowned gourmande Rabelais (a local boy) describes them as being made from water, egg yolks, saffron and spices (which I guess is why they are available as takeaways at the Foire au Safran in Preuilly). I decided to try my hand at making them, but none of the recipes I found looked terribly authentic, or they were for a sweet version more like brioche. Therefore, I decided to create my own not terribly authentic recipe, as that seemed to be the tradition, with every family having their own variation. 1/2 an aubergine, cut lengthways. Put the flour and salt in a mixing bowl and combine. Cut the butter into cubes and combine with the flour, using the cake beater attachment of your mixer. Add the sourdough starter and beat some more. Gradually add the water and beat for 10 minutes on the slowest speed (this is to begin developing the gluten, like kneading does). Cover the bowl and leave in the fridge overnight to rise slowly. Meanwhile, prepare the aubergine by scoring it in a diaper pattern all over, down to the skin. 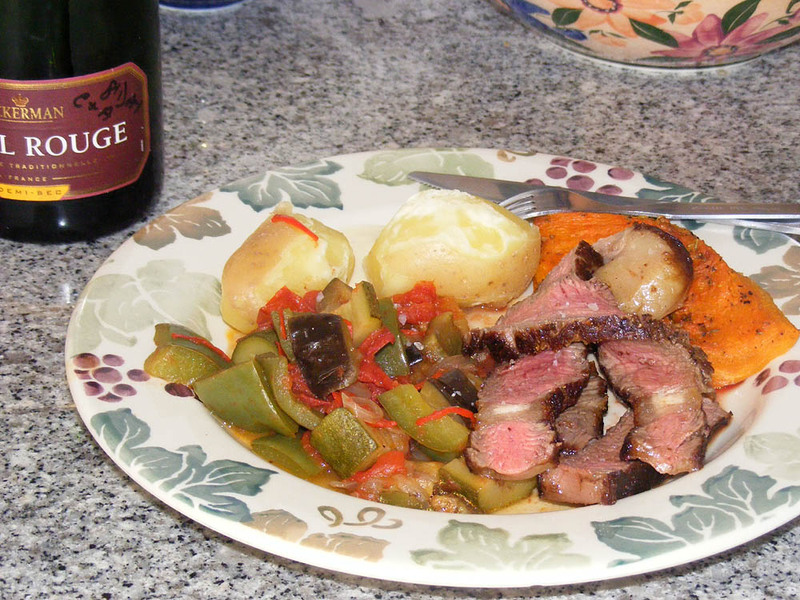 Paint it lightly with oil and roast it in the oven at 200C for 25 minutes. When it is soft and cool enough to handle, scrape out the flesh and mix in the spice. Tip the dough out onto a floured bench and knead it a bit by hand to knock the air out. Divide the dough into 12 lumps and roll them into balls. Take each ball and roll it out into an oval 15-20 cm across. Put either a piece of tomato and a semi-circle of cheese, or a teaspoon of aubergine puree onto one half of each oval. Fold the dough over and press to seal and flatten. Heat a heavy frying pan to moderately hot and brush with oil. Place a couple of the fouaces in at a time. Cook them for 3-4 minutes each side, until they are just beginning to blacken. *for instructions on how to make a sourdough starter see here. Alternatively, if you have been given a Herman starter, this works perfectly well, and is in fact what I used. For a recipe that looks a lot like the street food ones I have had stuffed with rillettes, see here (in French). I only found this after making my own rather different, but still practical and tasty, version. Look at this monster. It's a Richard-Brasier 96hp racing car. It may only have 4 cylinders, but that makes for an 11.3-litre (11.3 litre!!) 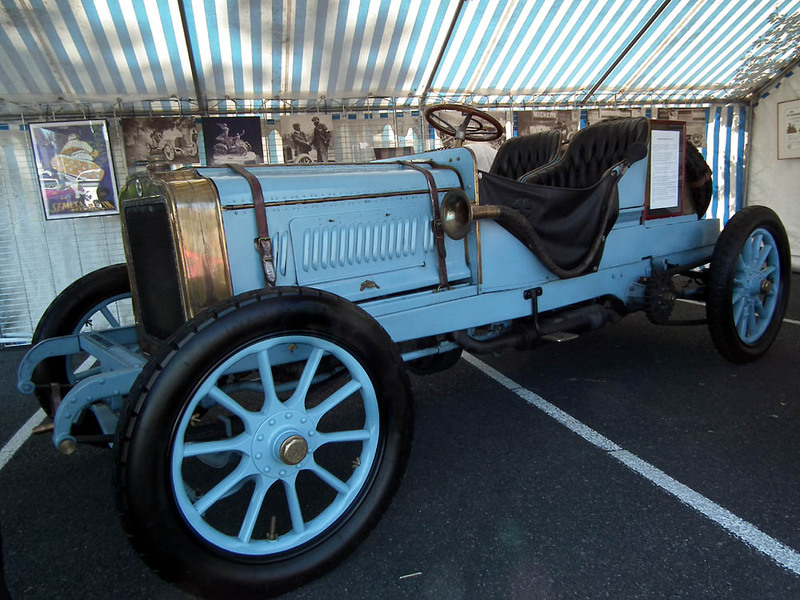 engine, and it was the winner of the 1905 Gordon Bennett cup. Here is a photo of it in action. Gordon Bennett was an interesting character. Heir to a fortune - and the New York Herald - he was the man who sent Stanley to look for Dr Livingstone (I assume there was a story in that) but is more noted for being profligate. Not only did he sponsor what eventually became Grand Prix racing, he also established prizes for yachting and ballooning and once set a wad of bank notes on fire because they were uncomfortable in his pocket. He spent much of his life in France, being educated here and founding the Paris Herald (which eventually became the International Herald Tribune). You can read all about him, and the expression Gordon Bennett! here. 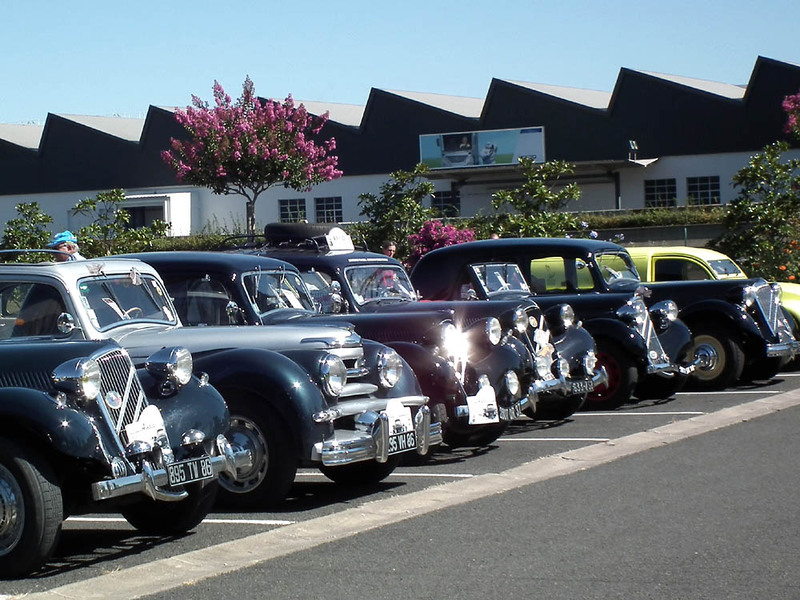 This photo was taken at Autos Enjouées in Joué-les-Tours. We have been in Paris the past few days, and as is usual we have stayed at the Hotel le Laumiere in the 19th. 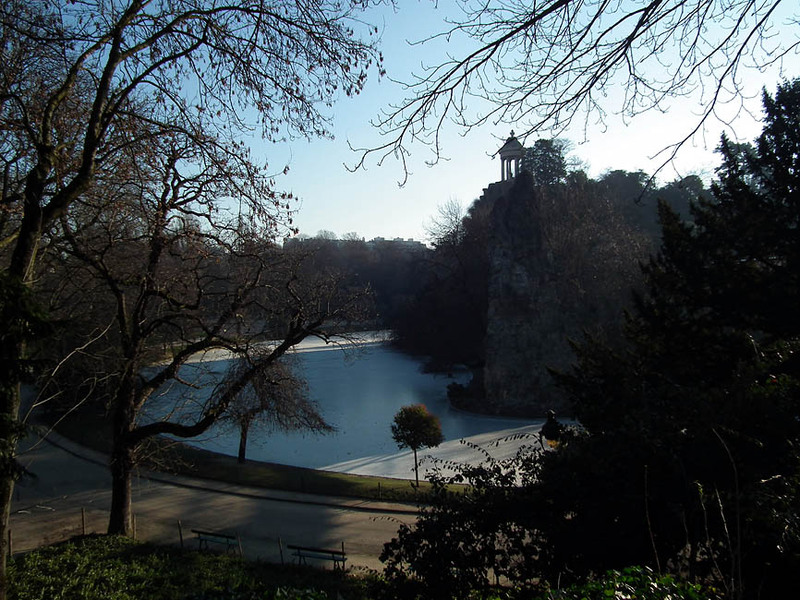 One thing we always do when we stay there is take a turn around the Parc des Buttes Chaumont, which is a 3 or 4 minute walk away. These photos weren't taken on this trip, however, they were taken when we were in Paris in February, visiting Retromobile. 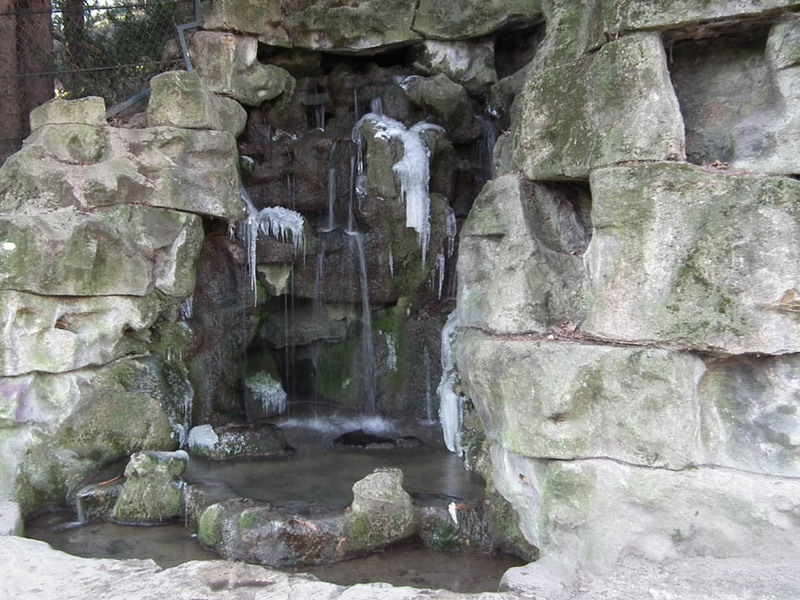 At the time, Paris was suffering the Grand Froid (the opposite of a canicule). 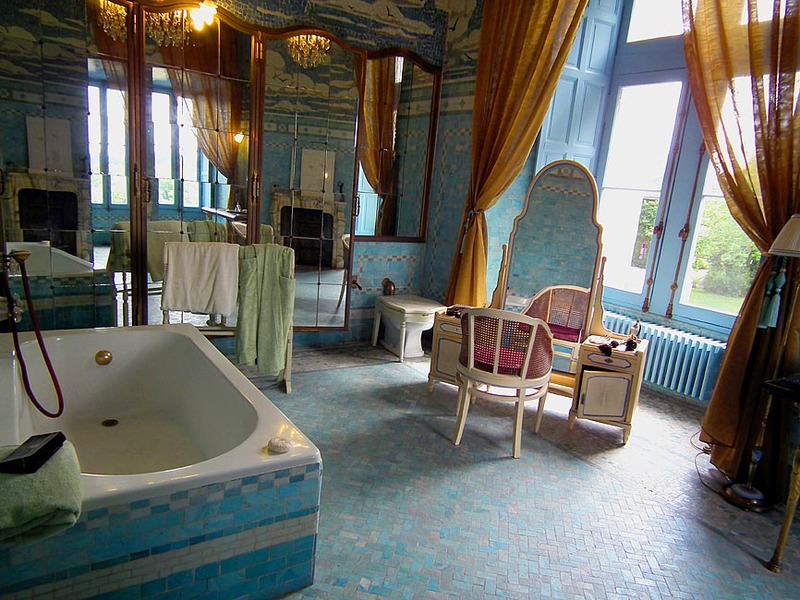 The bathrooms at the Chateau de Candé, on the outskirts of Tours, are fine exemplars of Between the Wars bathing luxury and elegance. When Charles Bedaux acquired the place in 1927 he was the 5th richest person in the United States. He subjected the building to a complete overhaul and extensive modernisation. 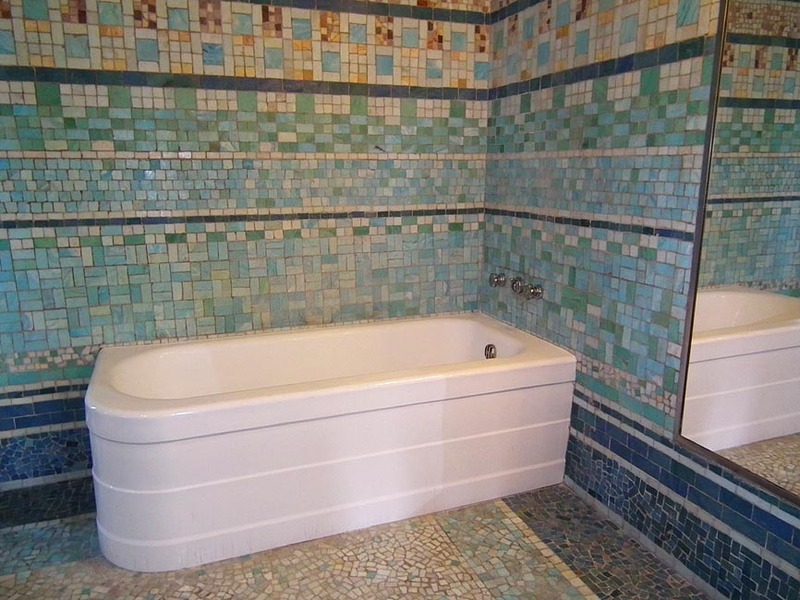 The house was the first private residence in France to have a telephone and 60 tons of pipes were shoehorned into the walls for that very modern indulgence, hot and cold water on tap. Although Charles was French, he had made his money in America and was a big fan of American style plumbing. The baths at Candé could be filled and emptied in under a minute decades before the surrounding village houses got piped town water. 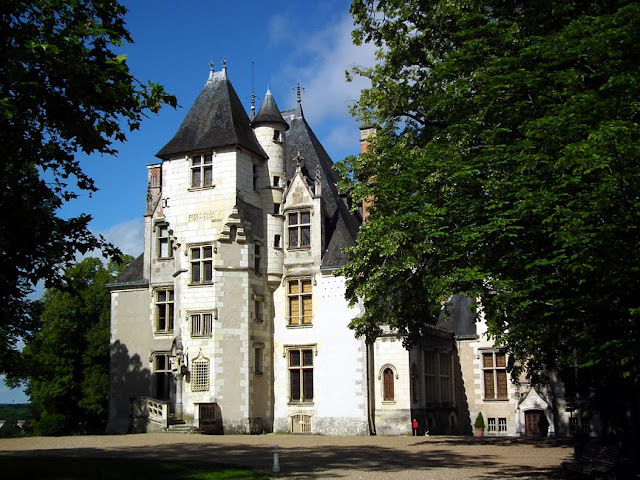 If you are local and visit chateaux regularly, the Conseil Général d'Indre et Loire offers a very good value season ticket to all the sites they own and manage - Chinon, Candé, Prieuré de St Cosmes, the Logis Royal and Donjon in Loches, the Balzac museum at Saché, Hotel de Gouin, the Rabelais museum at Hotel de la Deviniere, the Museum of Prehistory in Grand Pressigny and the Parc de Richelieu. The annual ticket costs €14 and gives you and your guests a discount or free entry at each of the sites. The tickets are called Cartes Ambassadeurs and can be purchased at any of the sites included in the scheme. Lingerie (pronounced lë-zhree in French, with 'ë' representing a nasalised i) is a word that has been absorbed into English and the pronunciation modified (lon-zher-ay). Go to Forvo to hear native French speakers saying it. Lingerie in both languages means the same thing. However, brassiere is a false friend. A brassière is what I would call a singlet, and I think only used in reference to baby clothes here. French bras are called soutiens-gorge ('throat supports'!). They don't have cups, but bonnets ('bonnets'). French sizing, however, is a perfectly sensible system - centimetres around the body just under the breast, ie your band measurement, not some randomly assigned number, and cup sizes are indicated by letters of the alphabet, A being the smallest volume. à droite, un soutien-gorge à armatures (underwire bra) et un slip. Women's underpants are usually les slips (bikini briefs), les boxers or les shortys (boyleg briefs) and les culottes (full briefs). Interestingly, I notice that UK and Australian underwear retailers no longer bother to mention cotton lined crotch gussets - it is presumably now a given. Yet French retailers often feel it desirable to list fond doublé coton ('doubled cotton bottom') in the description of a pair of underpants. French sizes for underpants are a randomly assigned number, that do not bear any sensible relationship to your actual measurement. *Push-up bras are often referred to as les balconnets in France (for the technicalities see this post from The Stage Door, in French). They give you a noticeable décolleté (cleavage). My understanding is that the English decolletage, meaning cleavage, is a false friend. The French word décolletage isn't used much and when it is, only refers to a deep or wide neckline of a garment, and not directly to the view it affords of the body beneath. Ken may be able to clarify. Hunting land is categorised in a number of ways which may restrict who is allowed to hunt. The category a parcel of land falls into can be identified by the signs prominently displayed on the boundaries. 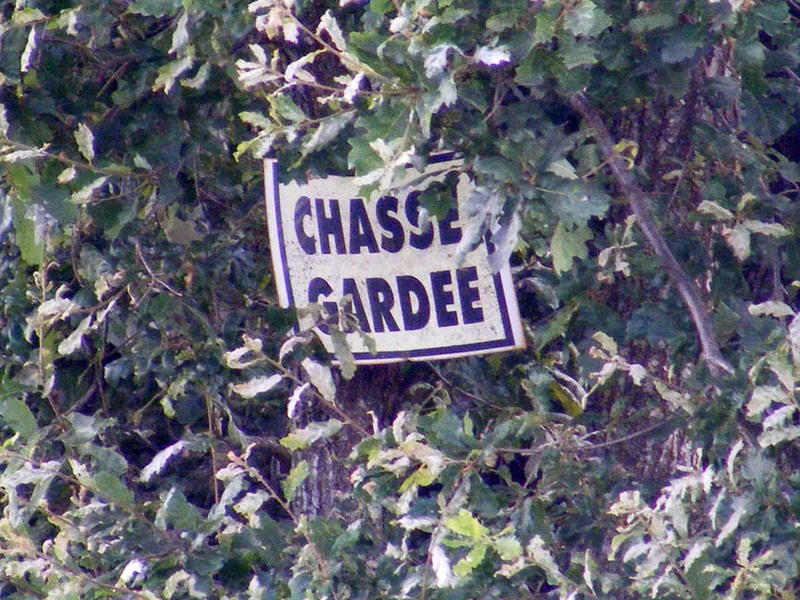 Chasse gardée means that hunting is the main activity undertaken on the land, and it is managed to maintain a good population of game. Non-hunters are not welcome on this land as they will disturb the game. Hunters need the permission of the landowner to enter. Chasse réservée means that unless you have permission from the owner you can't hunt there. In practice it usually means the land is reserved for the local communal hunt. 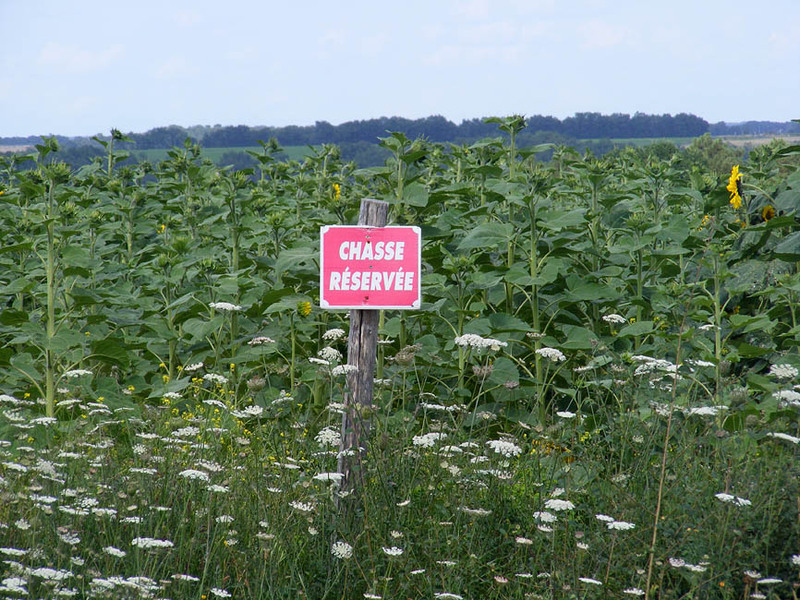 Chasse privée signs mean an estate of more than 20ha which you cannot hunt on unless you have the owner's permission. These are usually the private hunting estates, which operate more or less according to the wishes of the owner and cater for paying clients. Chasse interdite means that the land has been officially registered as withdrawn completely from any hunting activity. It means that even the landowner cannot hunt on the land, and you very rarely see this sign here. Temporary signs on the roadside saying Attention! Chasse en cours mean that the hunt is currently operating in that area. You need to be careful of dogs or game dashing across the road. Occasionally you may encounter a mounted huntsman, in which case you should give the horse a wide berth at a slow even speed. Usually the huntsmen are on foot though and wearing hi-viz vests. If they are carrying a gun it must be uncocked or broken. If the hunt is only just starting beware of panelvans slowing down and turning off. The hunting season opens in Indre et Loire today. For the rules about what can be hunted, how and when throughout France, go to the Féderation Nationale des Chasseurs website. 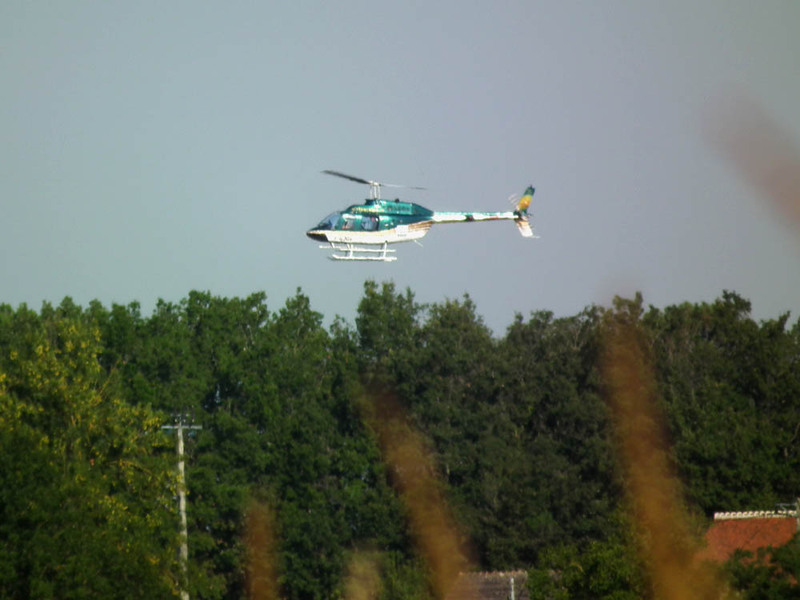 When I was on a walk the other day I saw this helicopter flying low over the Claise Valley. 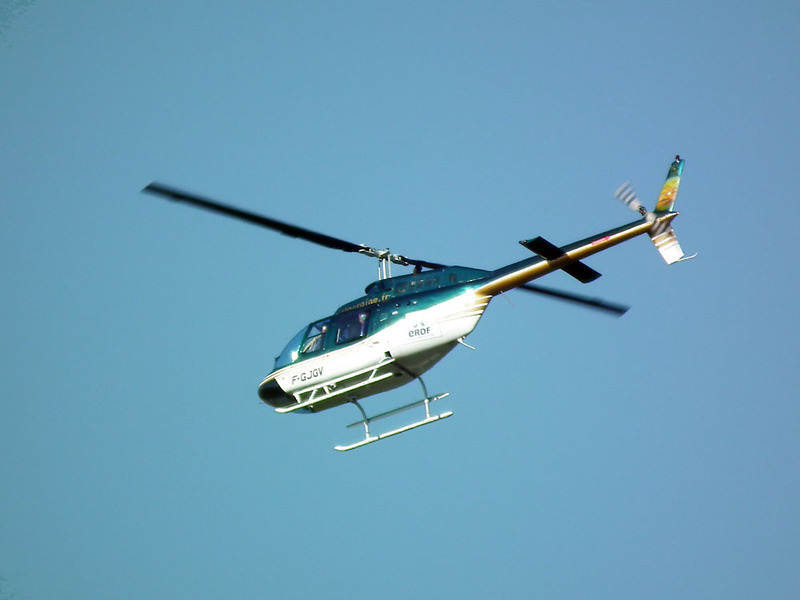 Usually a low flying helicopter is bad news for someone, because most times it means a medi-evacuation for a poor unfortunate who needs a hospital faster (or smoother) than an ambulance can get there. So this was going to be a blog about medical evacuation - except that is isn't, because when I looked at my photos later I saw it was a helicopter hired by ERDF (the electricity people) to fly low following electricity lines and looking for problems. There is often a notice on the town notice board warning people of these flights, I assume either to alert you to the fact that naked sunbathing may not go un-noticed, or to calm the nerves of the black helicopter brigade. For the technically minded people amongst you it is a Bell 206 B Jet Ranger III, immatriculation F-GJGV from Touraine-Helicoptre. 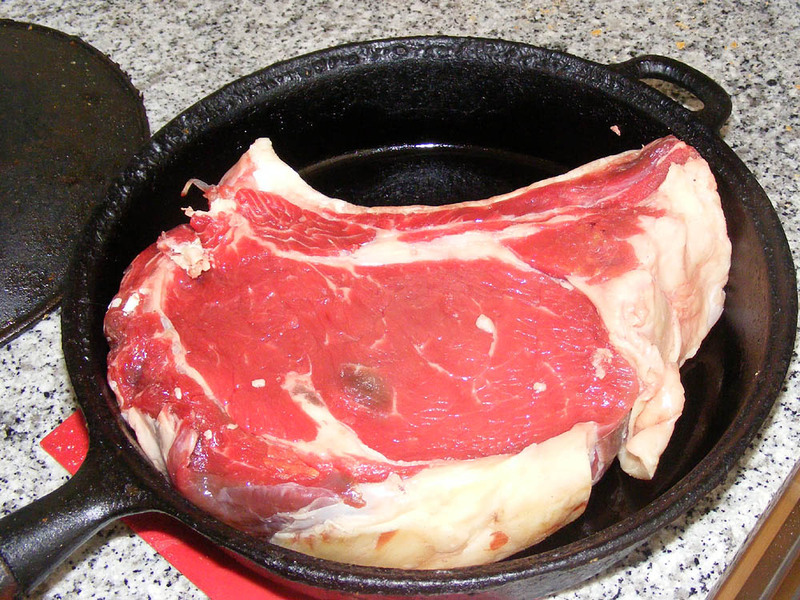 A few weeks ago I bought a piece of cote de boeuf (beef rib roast) from the butcher in Preuilly's high street, la Grande rue. This is somewhat extravagant for us. It cost €21.69, weighing 1.16kg and being €18.70/kg, but I blame Ken and Alexander. When I got it home I realised the piece I had bought was slightly too large for the pan I wanted to cook it in. I had nothing else suitable - all my other pans were either too lightweight or way too big. 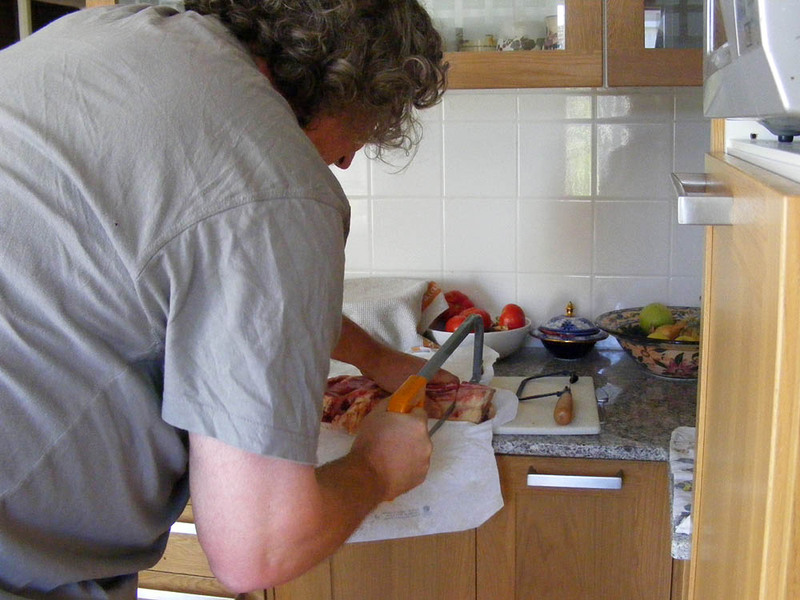 Thus we decided to engage in a bit of butchery, and Simon got out the hacksaw and set to work on the end of the rib. It only needed a few centimetres removed, something he achieved quickly and easily. I seasoned the meat with freshly ground 5 baies (a pepper mix of black, white, pink, green and coriander) and heated the pan to smoking. Five minutes searing on each side and 5 minutes resting - it was delicious. I can hold my head up again, and we had several days worth of roast beef sandwiches as a bonus. 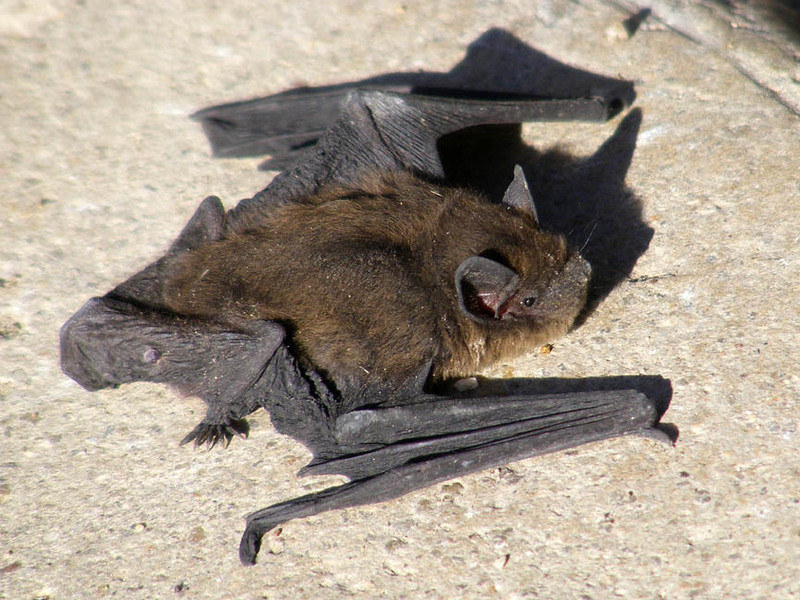 One evening in late July I went out to lock the garage and discovered a bat 'legging' it across the driveway. They can move remarkably rapidly on the ground by swinging their wings forward and using the hooked thumbs as pivot points, waddling behind with their hind feet. Nevertheless, it appeared to be injured, with the left wing being held awkwardly. 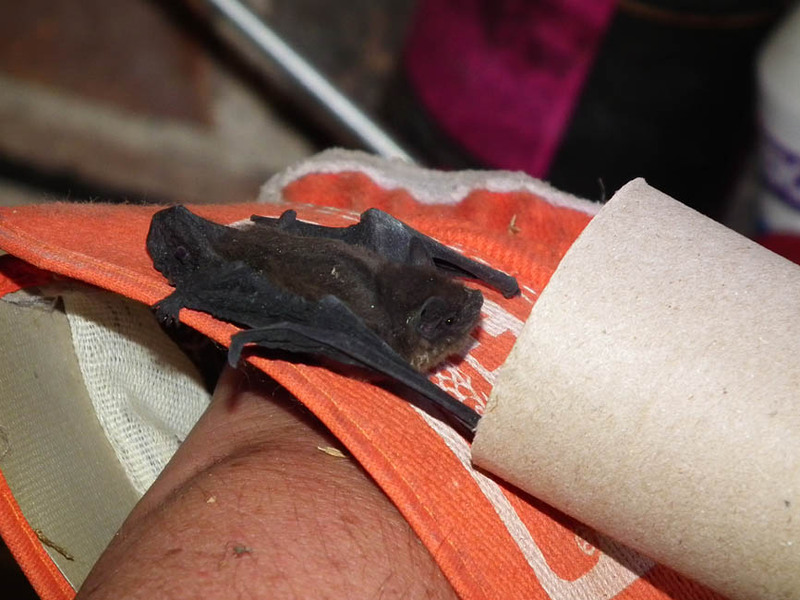 I rushed inside to get the bat rescue gear (gloves and a toilet roll), my camera, and called Simon, so he could come and see the bat. I could only find a huge leather work glove, which meant that when I picked up the bat by gently encouraging it on to the glove, it kept wanting to snuggle down under the capacious wrist band. You are not supposed to touch bats when you rescue them, so this wasn't ideal. Eventually I managed to get it to settle in a crevice in the stones of our granary, but several times it determinedly climbed down and legged it across the grass. I was worried about one of the many neighbourhood cats spotting it. As small mammal specialists they would make very short work of an injured and grounded bat. I was interested to note that whenever it encountered a spiderweb that it got entangled in it stopped and carefully removed all the strands. It was clearly small enough to be seriously impeded by the sticky filaments. It reminded me that when I worked for the National Trust we always made sure that house staff knew that the triangular sticky insect monitoring traps were not to be used anywhere that a bat might be tempted down to eat the trapped insects. We had heard of a few cases where the bat itself got trapped on the sticky surface of the cardboard. We can only speculate that it had been roosting for the day under the wooden palisade gable of our garage. The palings are in poor condition and are now rather loose. They flap a bit in the wind and maybe it got knocked from his perch. 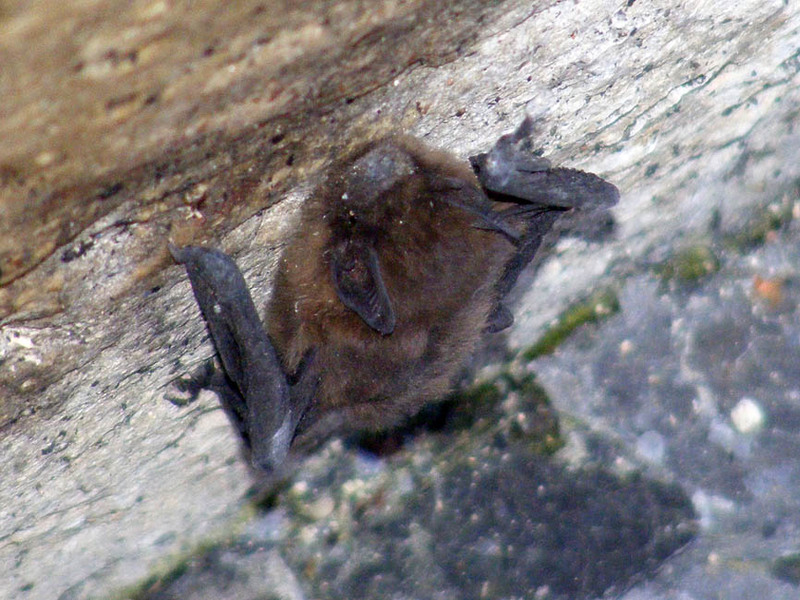 Unlike the previous bat we had to rescue, who was outraged at us accidentally knocking it to the ground when we removed a piece of rotten lime mortar, this little chap was entirely passive and unaggressive. It just looked around and sniffed the air a bit, but did not appear distressed by being handled or attempt to bite. Very sadly, in the morning, I found a little brown furry body in the driveway. I took the opportunity to measure it and confirm the identity. 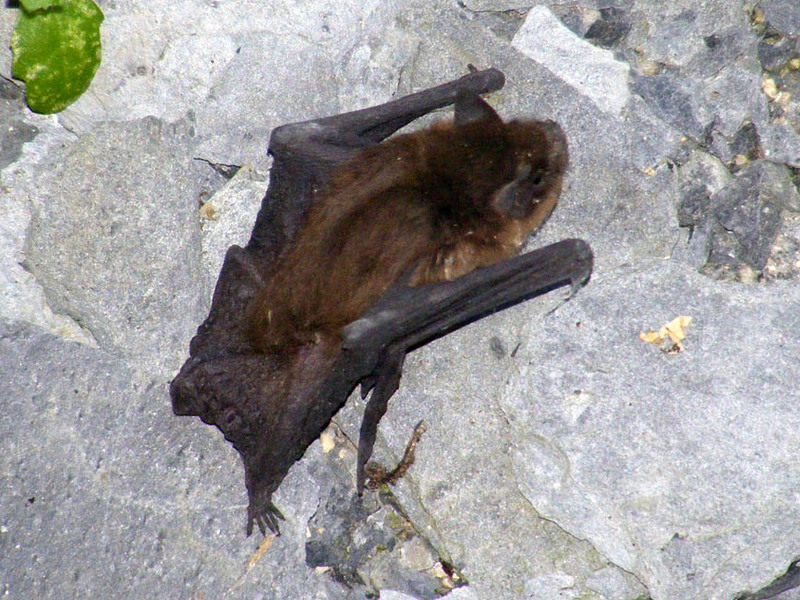 It was a pipistrelle, only 3.5cm from nose to rump, with a 2.5cm tail. This is only just within the size range for an adult pipistrelle, so I assume it was one of this year's youngsters. 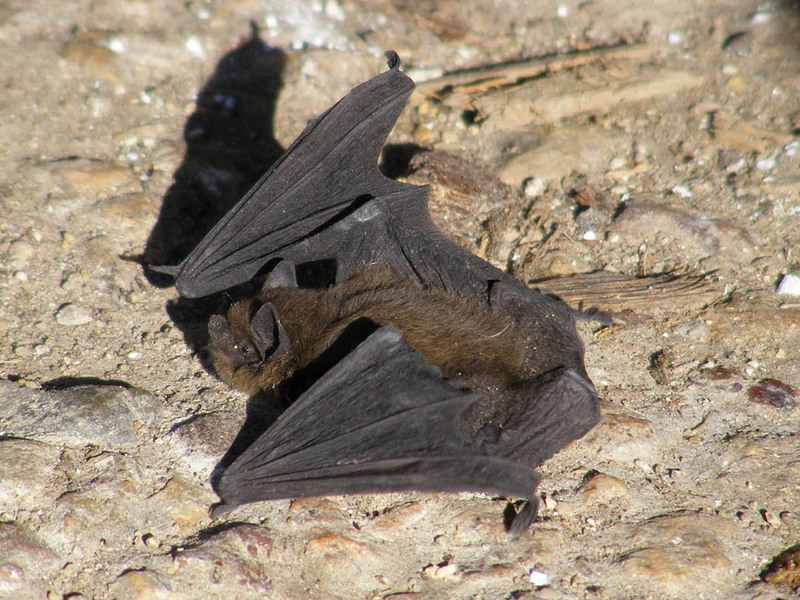 Tim pointed out to me that bats dehydrate very quickly and that it is a good idea to offer them a drink by placing a straw holding water in front of them (a thumb over the end will hold the water in the straw and allow the bat to lap water from the other end). I wish I'd thought to do that now. The little body is now in a tomato pot, providing fertilizer and decomposing to bones so I can examine the teeth later and determine which species of pipistrelle it is. 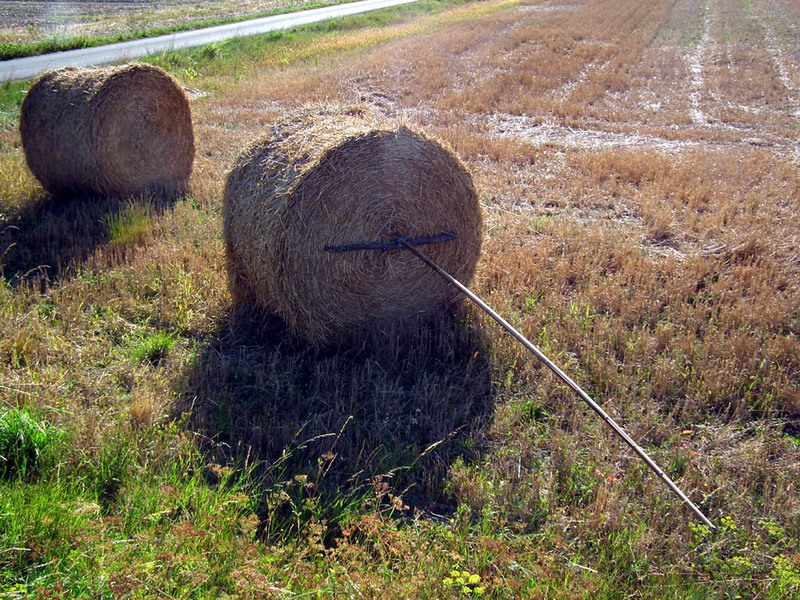 Late summer, and all over Touraine the hay bales are once again on the move. Except for this one, which has either been customised for a purpose which is beyond me, or sacrificed with a bamboo spear in some heathen French ritual. The annual open house weekend, known in France as les Journées du Patrimoine (heritage days) is coming up on 15-16 September. 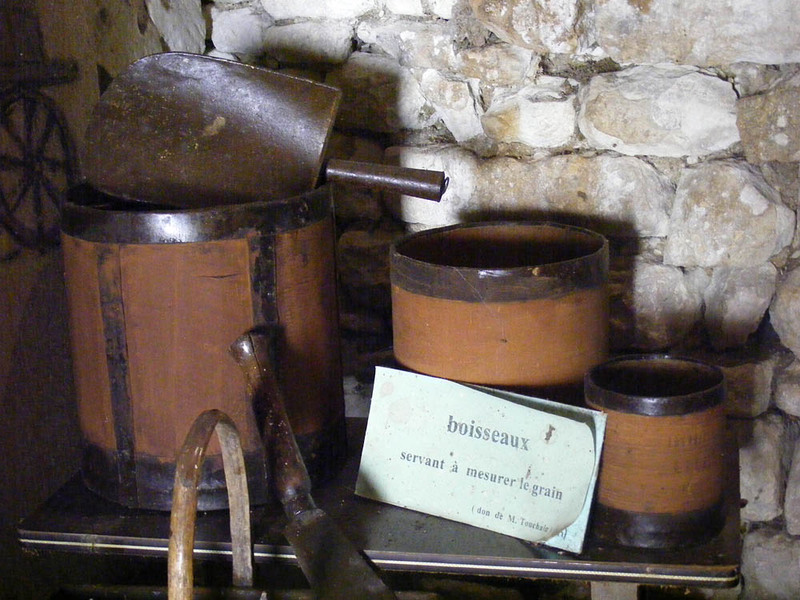 Amongst the many places you could visit is Preuilly's little museum in the Poterne. 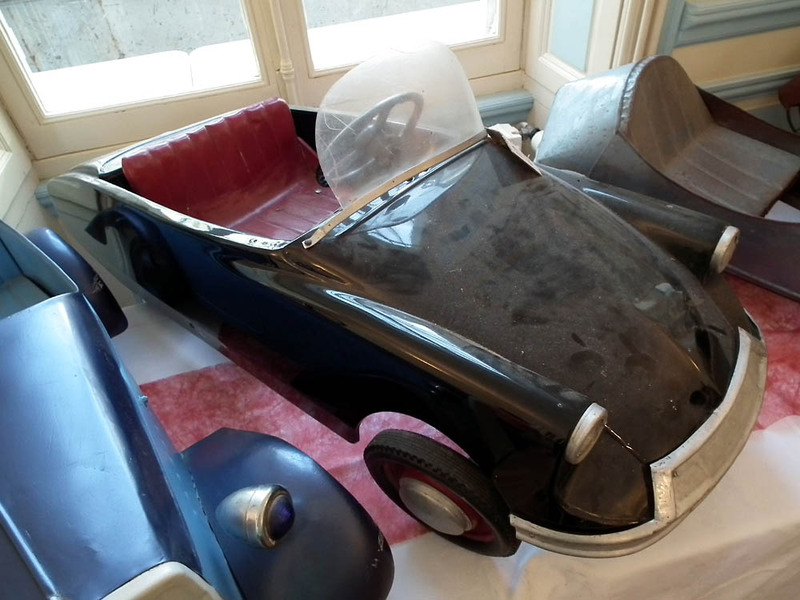 As local museums go it's not at all bad, with many objects that refer back to Preuilly's past from prehistoric times to the Second World War. Because it is staffed by young volunteers it is only open during the summer holidays and the journées du patrimoine. 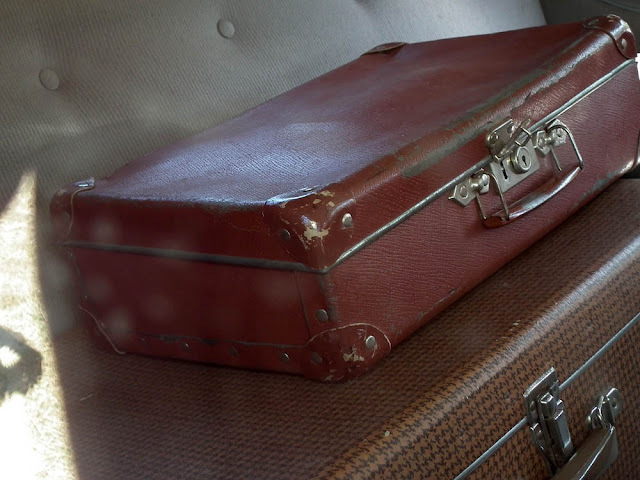 The objects from the museum in the photos have a special meaning for us. Regular readers will be aware that our property is a former grain merchant's. 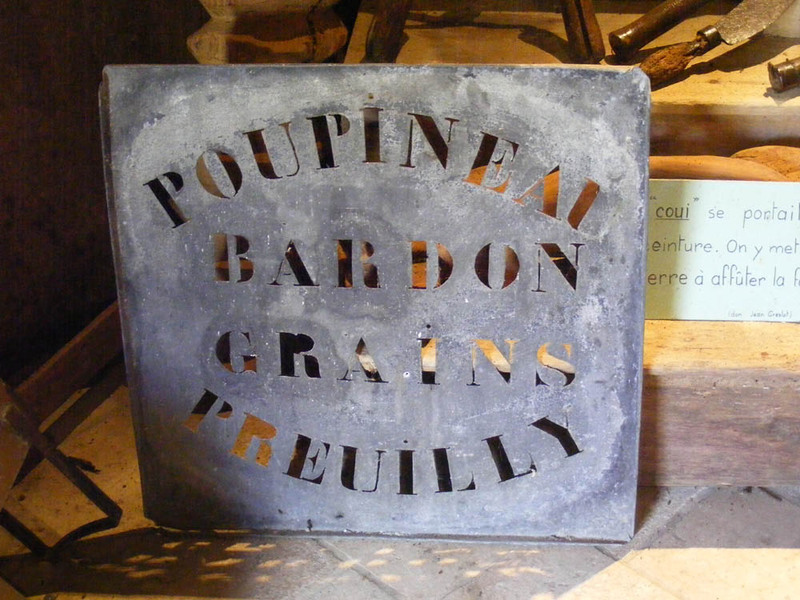 In the first half of the 20th century it was run by the Poupineau Bardon family. The grain measures were also gifted by the family connected to our place. Just recently I got an email from someone out of the blue. I didn't know them but they were planning to holiday in the area and were researching local sites with wall paintings with a view to visiting them. She had come across a snippet of information about the Chapelle de Tous-les-Saints in Preuilly-sur-Claise and knew that it had wall paintings. She'd seen the photos on the town website, and our blog post on the chapel. 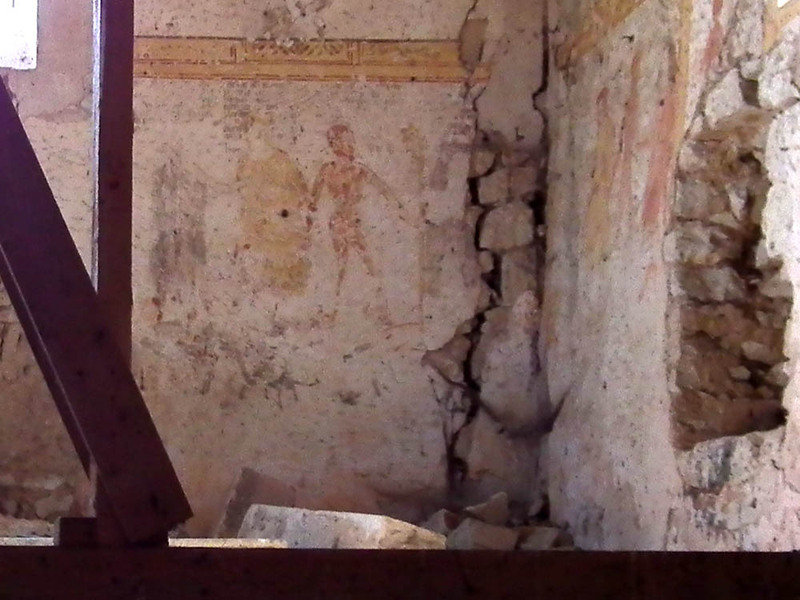 Sadly, I had to tell her that the building is in too dangerous a state to let people visit, but it did remind me that I have been meaning to write about the wall paintings for ages. Quite by chance, the same week, I was tipped off that one can see the paintings by peering under the door of the chapel, and so by poking the camera under the door, I've even managed to get some photos. The next step was to spend an afternoon in the library researching the local history articles. The Danse Macabre of the Women. The history of the chapel and its wall paintings over the most recent hundred years is a disturbing tale of under resourced high minded altruisim by private individuals on the one hand and shameful inaction (or worse) on the part of the local authorities. 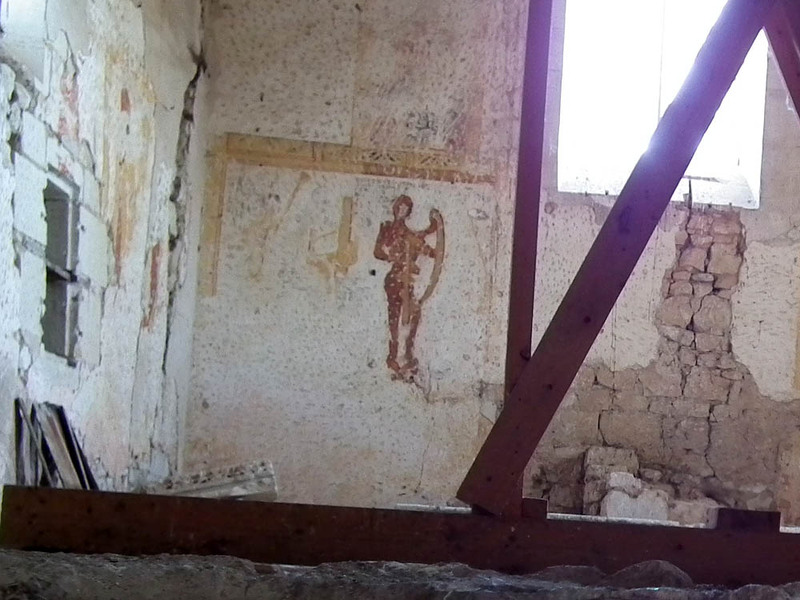 The wall paintings were only rediscovered in 1957, by accident, when the building was on the point of demolition. 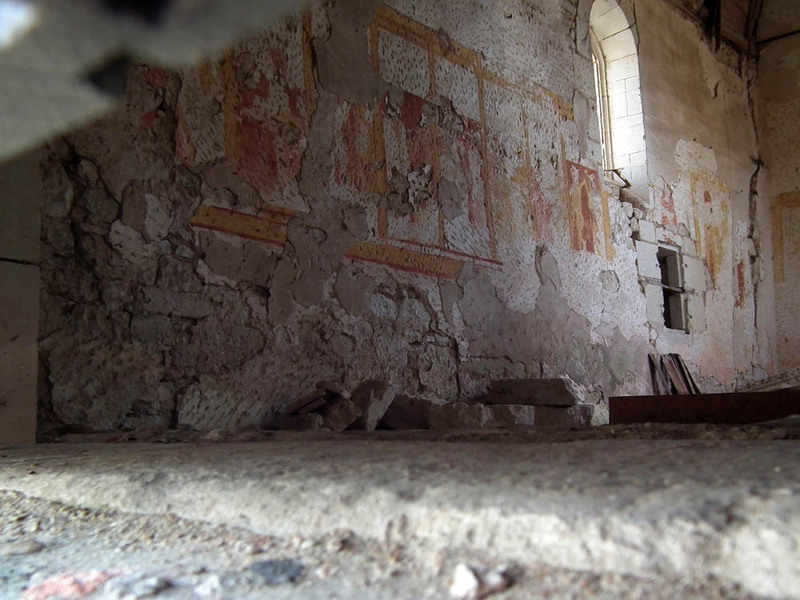 A visiting architect and his companion idly picked off some render on the interior walls and realised there were significant medieval paintings underneath. The building had been hastily listed as a national monument in 1953 and a local heritage group provided the town council with a modest grant for its maintenance. The grant was not used and the charity asked to be reimbursed - a request which was ignored! Not only that, but the council lobbied to have the building declassified and actively attempted to demolish one gable end!! 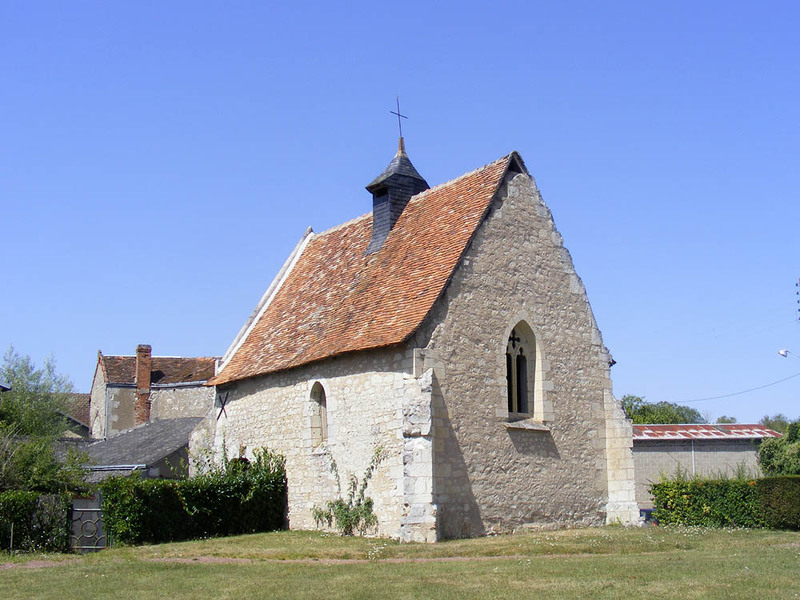 Finally the architect, Henry Lhéritier de Chézelle, acquired the chapel privately and used his own money to stablise the walls and make it watertight. When his health failed and he could no longer continue the work, his children tried to raise the money necessary to finish the restoration. Although the townsfolk were supportive, and local tradesmen offered their skills for free ('to pay back all the petty vandalism that we did in the chapel when we were kids') the council continued to allow the building to deteriorate after it reverted to their care. The Orchestra of the Dead. 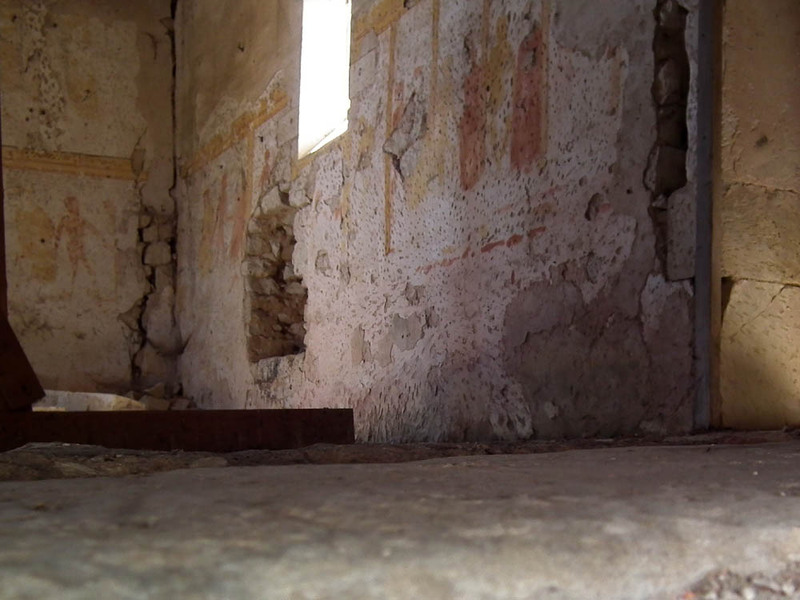 The significance of this chapel lies in the presence of a danse macabre painted on the interior walls. Its state of preservation is quite poor. The technique used to create it partly explains the fragility of the work - as always with wall paintings, which are done with pigments mixed with glue on a dry wall. 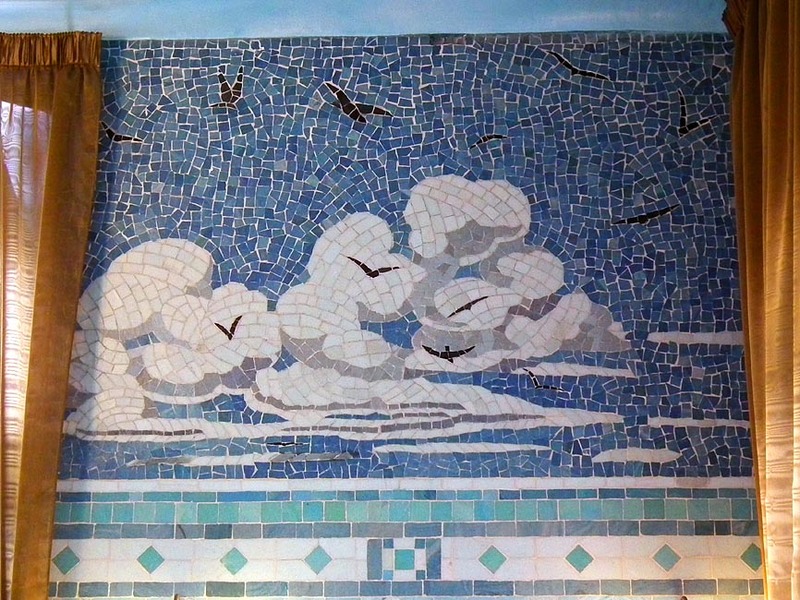 It is not a fresco, which are done on fresh damp render. In addition, the faces of the characters portrayed have been systematically hacked away. This act of vandalism probably dates from 1562 when Protestant troops took Preuilly in the Wars of Religion. Their iconoclasm is responsible for the damage to numerous works of art. Later the paintings were covered by a uniform layer of lime render. To ensure its attachment, the plasterers had to create a key by chipping the walls all over with a pick. This operation had the twofold but contradictory effect of protecting the paintings from light, but damaging them with pick marks. Since their rediscovery the danse macabre has sustained other damage from various acts of ill will, making the reading of the story more and more difficult. The Danse Macabre of the Men. on the right, as you enter, 9 visible panels of 160 x 50 cm representing the Danse Macabre of the Women. The western gable, with the main entrance, was destroyed then recontructed, so the first few panels have practically disappeared. The female characters are the Queen, the Abbess, the Wife, the Maiden, the Old Woman, the Child, the Shepherdess, the Lover, the Nun, the Widow and the Village Woman. on the left, panels of the same dimensions, representing the Danse Macabre of the Men. The male characters are the Monk, the Archbishop, the Legate, the Lawyer, the Schoolmaster, the Minstrel, the Bailiff, the Emperor, and the Pope. on the left of the former altar is the Orchestra of the Dead, made up of 4 musicians - one holding some bagpipes, another a portable organ, one plays a psaltery (a harplike instrument) and the fourth is a flautist. This Orchestra of the Dead seems to appear as a motif in 1485.
on a higher level on each side of the altar one can, with difficulty, distinguish 2 characters. One is perhaps the clergyman who generally accompanies the Danse Macabre. In the order the characters are represented, Preuilly's Danse Macabre doesn't show any particular differences to an established tradition. In fact, the genre is extremely codified because the design of the danse was widely known due to several very successful publications of the day. The first to have been widely distributed was that made by a Parisian bookseller Guyot Marchant and illustrated by the Rouges brothers, appearing in 1485. It reproduced the fresco from the original Danse Macabre, in the Cemetery of les Innocents in Paris. The following year, when it was republished, Guyot Marchant added a Danse Macabre of the Women, which clearly inspired the one in Preuilly. Detail showing the Queen and the Abbess, both being approached by Death. The characters are outlined in black, and painted in yellow and red ochre. 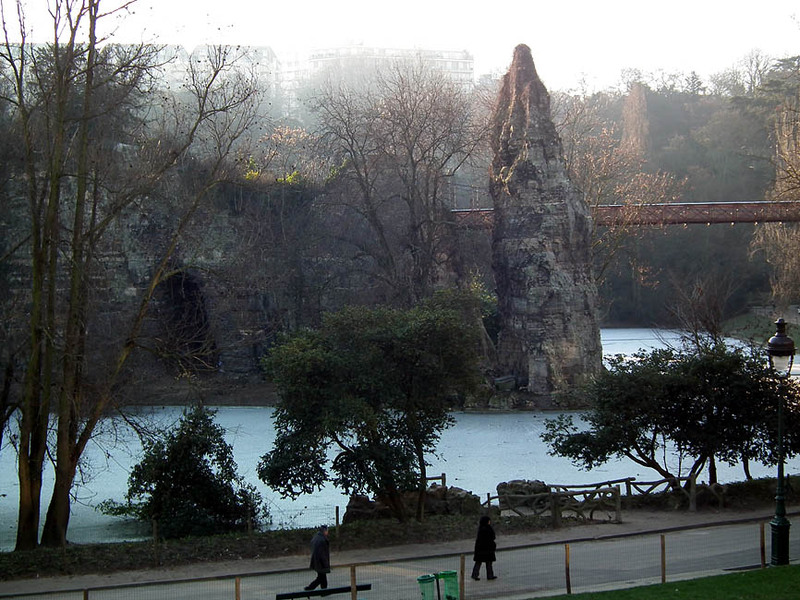 (An ochre quarry was found near Saint-Georges-sur-la Prée in Berry.) Each of the panels shows 2 characters - one living and one dead. The dead are here represented in the form of eviscerated cadavers. On the level above the panels is a poem in gothic lettering to accompany each scene. The poor state of preservation means that no indepth analysis of the style can be made. On the other hand, it is possible to suggest a date of creation, due to several indicators. The most significant comes from the presence of the Danse Macabre of the Women, which excludes a date prior to 1486. The lively costumes evoke the end of the 15th century. Therefore, it seems likely that the wall paintings, along with the building itself, were constructed in the last 2 decades of the 15th century. The Danse Macabre de la Chapelle de Tous-les-Saints represents the signature of an era. It carries an exceptional testimony of the state of mind, fears, anxieties and religiosity of the populace at the end of the Middle Ages. Death stalked the land in the form of plague, war and famine without respite, and without respect for social class, intellect or personality. This wall painting, despite being very altered by time and man, is precious nonetheless, because of its rarity (there being fewer than a dozen danse macabre extant in France). The responsibility for the care of the work is today in the hands of the local council. They must take it seriously and ensure the building remains safe (the tie-beam supporting the roof carpentry is broken, for instance, and should be repaired). They should also take steps to acquire the funding to conserve the paintings - it seems it would be available, if only the council would act to prepare an application! Some sections of the Danse Macabre are still sealed under a layer of render. Wouldn't it be great if we could get a professional in to study these unseen sections and maybe know a bit more about something which is an original and precious part of Preuilly, and France's heritage? At the very least, in the days leading up to the annual Journées du Patrimoine, it seems such a shame that this little treasure is not on the list of buildings open for people to see and appreciate, even if only once a year. Source: Reignaud-Bauchet, A-M et Walter, B, La Danse macabre de la Chapelle de Tous-les-Saints a Preuilly, Les Cahiers de la Poterne, 2003. Yesterday we went to Autos Enjouées at Joué-les-Tours. 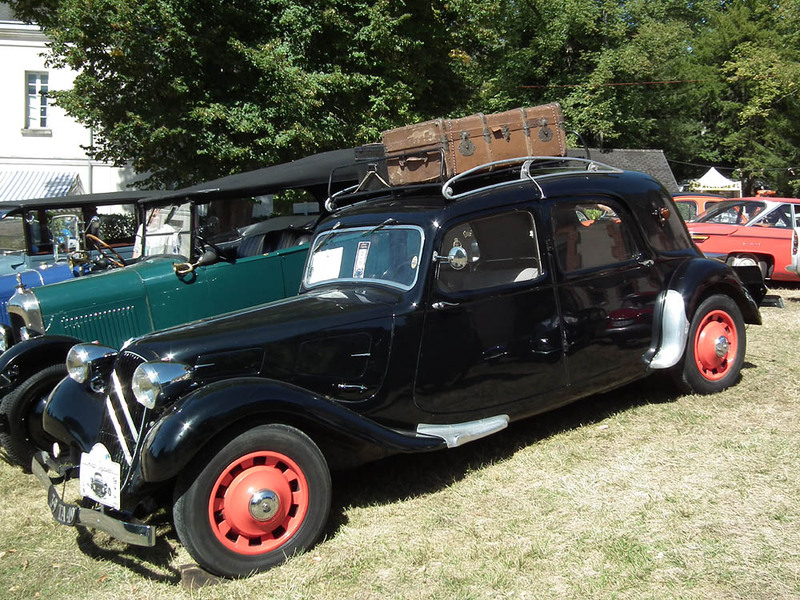 We have never been to the parc du Château des Bretonnières before, but even if it wasn't full of old cars it would be worth seeing. They have an aquatic centre with sailing, a number of walks wth various orchid locations marked, and lot of open green spaces - all in a satellite town of Tours that frequently gets overlooked. An identity parade of Tractions. However, yesterday it was cars we went to see and there was plenty to feast the eyes on. 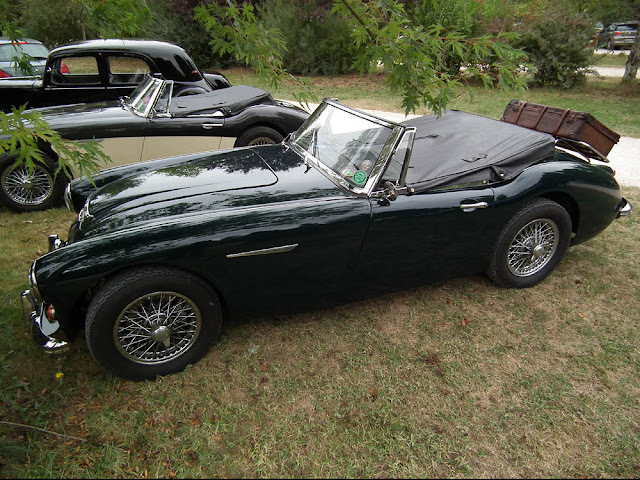 Of course, the majority were French cars (including at least one marque new to us - more later) but there was also plenty of Americana and British cars. 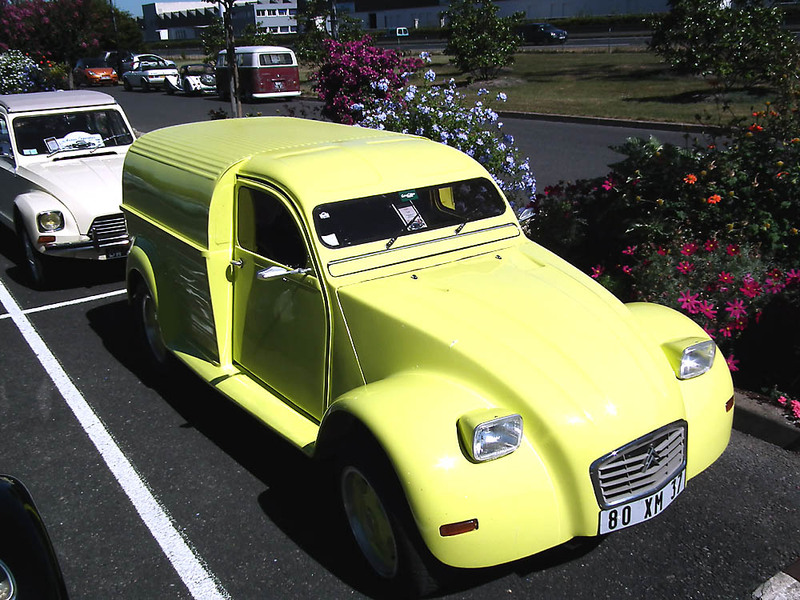 Hands up - all those who thought a 2CV hot rod was a good idea. Today I have concentrated on photos of Citroëns, but over the next week or two we will have some more exotic and esoteric stuff. The party continues today, so if you're in the area do drop in. It's free, there are beer tents and pizza vans, and lots of beardy car types if you feel the need for a chat. The website is here, and the programme is downloadable here. 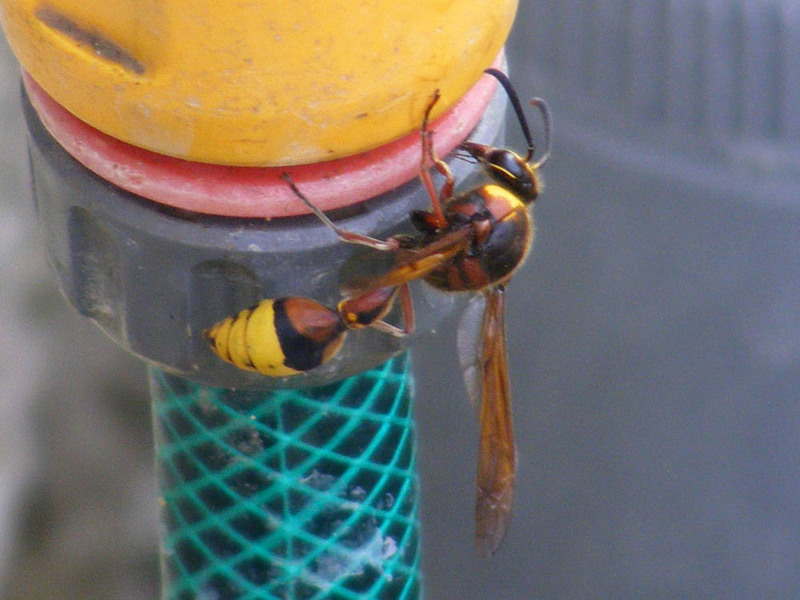 What should you do if you think you might have seen a Yellow-legged Asian Hornet (frelon asiatique or frelon à pattes jaunes) or an active nest? notify the mairie or communauté de communes. once notified, the mairie will contact FDGDON 37 (Féderation Départemental des Groupements de Défense contre les Organismes Nuisibles). FDGDON 37 will make contact with you and confirm whether you do indeed have frelons à pattes jaunes. To do this, a qualified person will make an identification from photos or dead specimens supplied by you or if necessary, visit your premises. reporting every individual Asian Hornet is important, as it helps to locate the nests. 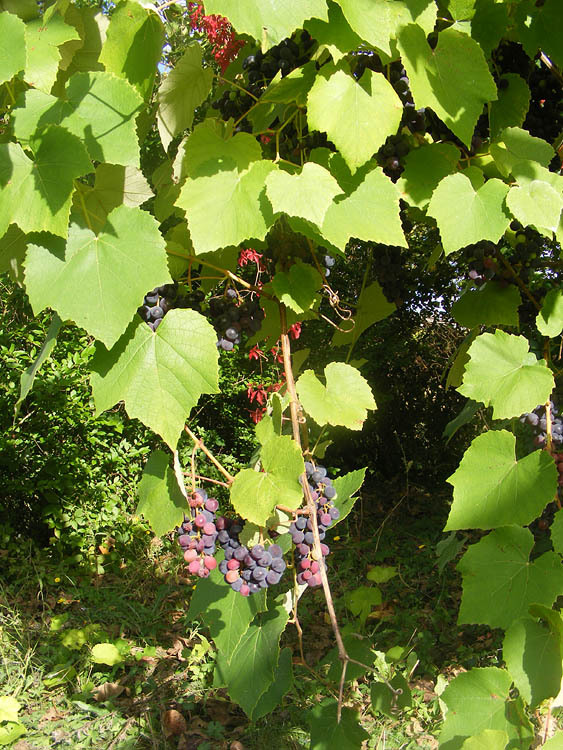 all the records are centralised to establish a database of this invasive species and monitor its distribution. 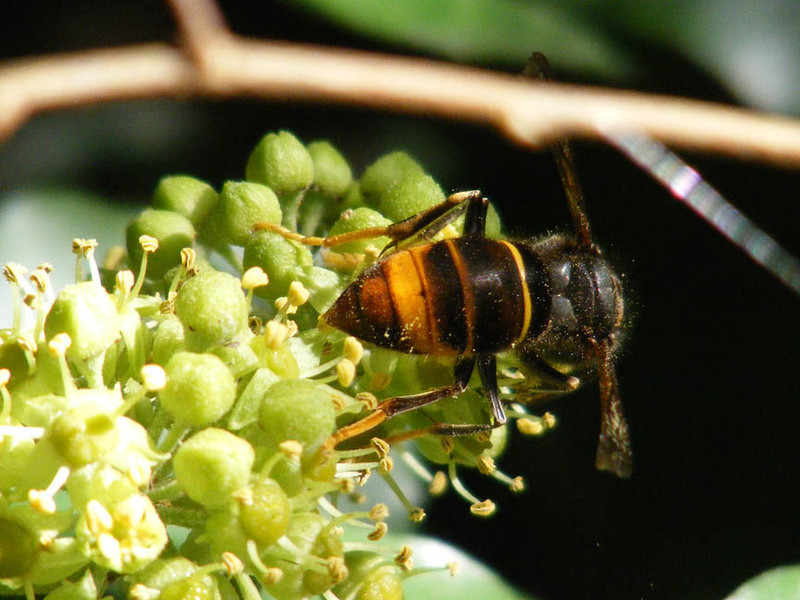 Yellow-legged Asian Hornets are recognisable by their yellow feet and black abdomen with a wide orangey band. Note how dark overall it is, with a black thorax, not brown. Note that the abdomen is mainly black, with plain yellow bands. What should you do if there is a nest? To destroy inhabited nests it is advisable to call a specialist business (applicateur hygiéniste). A list of professionals who adhere to a code of best practice can be obtained from FDGDON 37 (email: contact@fdgdon37.fr). Beware! It is dangerous to destroy the nest yourself. once destroyed, the pest controller will inform FDGDON 37. FDGDON 37 will inform your mairie. For further information download the leaflet (téléchargez la plaquette d'information sur le frelon asiatique) available on this website (in French, with photos). 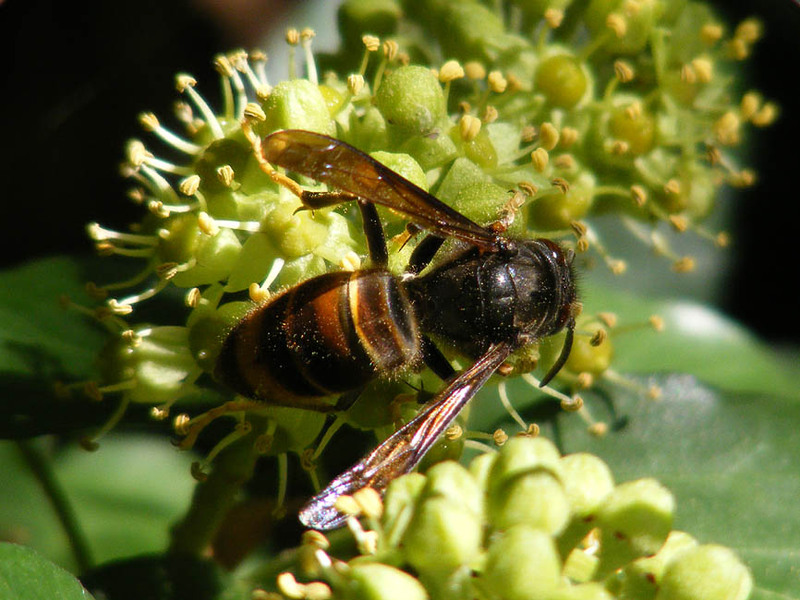 You can also go to my previous post on Asian Hornets or the Muséum National de l'Histoire Naturelle factsheet (in French). Source: The text in this post has been translated from the FDGDON 37 information leaflet, which local authorities are putting on their websites or displaying on their town notice boards. The photos and their captions in the post are mine. 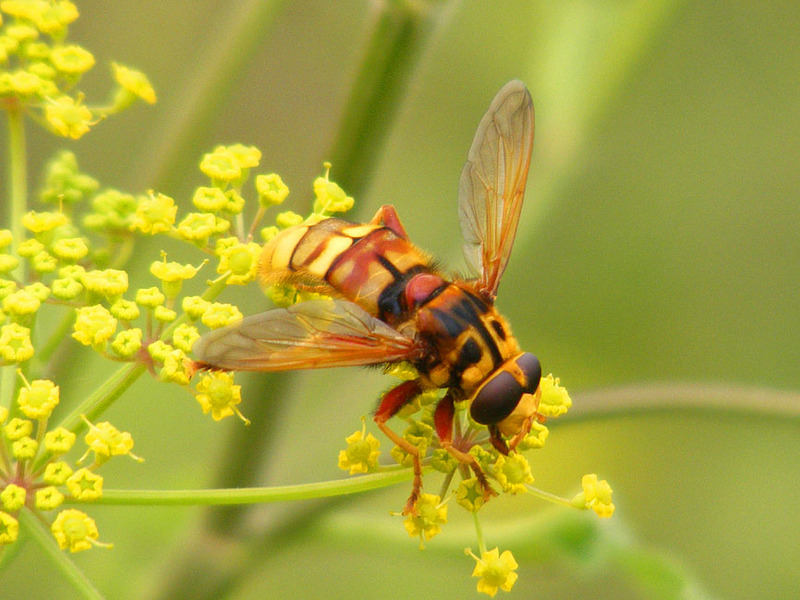 This is a very large hoverfly. Note the overall yellow, not dark, appearance. This is a large potter wasp. Note the extreme 'wasp waist'. 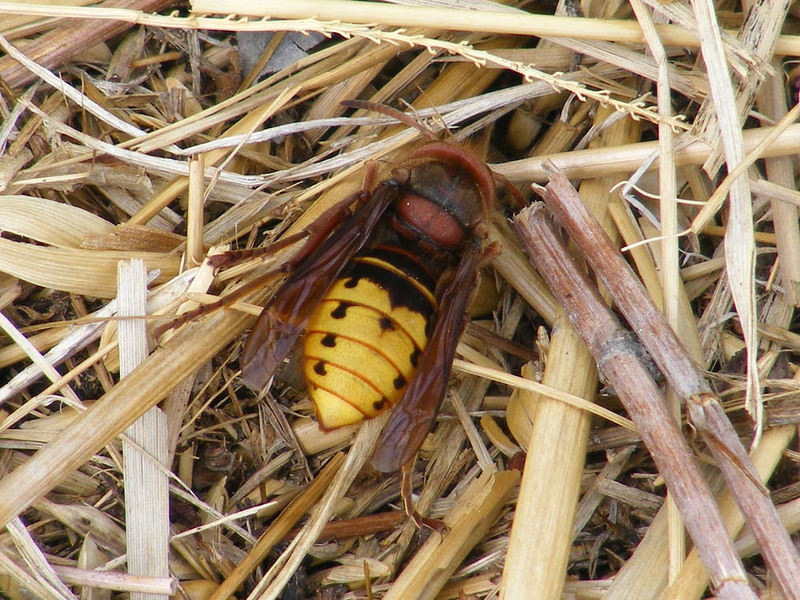 This is a European Hornet. Note the brown thorax and mainly yellow abdomen. Less Chat, More Swimming, svp!